The LAB-XUSB is a platform for experimenting with PIC(R) microcontroller (MCU) applications. It contains the circuitry required by the PIC MCU to operate: 5-volt power supply, oscillator, reset circuit, as well as additional application circuits including switches, potentiometers, LEDs, LCD module, RS232 interface, USB interface and speaker, among others. A prototyping area is also included in case we missed your favorite circuit. Many different projects may be created using the LAB-XUSB. Some examples include a calculator, LCD clock, digital thermometer, LCD backpack, data logger and many more. All of the PIC MCU I/O pins are brought out to a header that allows connection to off-board circuits. The LAB-X1 can run programs written in assembler, C and PICBASIC� or PICBASIC PRO�. 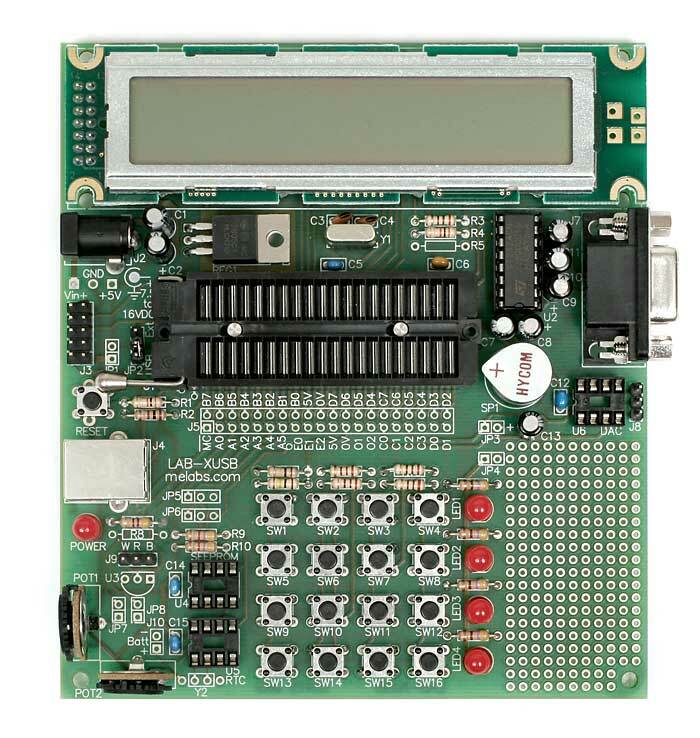 It includes an in-circuit programming connector so the resident PIC MCU may be reprogrammed on the fly (requires flash device) using programmers that support this feature like the EPIC� Programmer and the melabs Serial Programmer. The LAB-XUSB includes in-circuit programming connectors so the resident PICmicro MCU may be reprogrammed on the fly (requires flash device) using programmers that support this feature. Because the LAB-XUSB itself is not a programmer, a separate PICmicro microcontroller programmer, such as the melabs Serial Programmer is required to program a PICmicro MCU. The LAB-XUSB is designed to work with 40-pin PICmicro MCUs. It is recommended the LAB-X1 be used with the 40-pin PIC18F4550. This flash device has is equipped with the USB module necessary to build USB peripherals.